Cameron Boyce (born May 28, 1999) is an American actor. 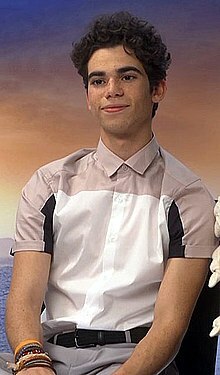 He is known for his roles in the feature films Mirrors, Eagle Eye, Grown Ups, and Grown Ups 2, and for playing the character Carlos in the Descendants television films, as well as for his starring roles as Luke Ross on the Disney Channel comedy series Jessie, and as Conor on the Disney XD series Gamer's Guide to Pretty Much Everything. Kevin Hart. He's the man! I like his style. He's short, so I can relate. All the stories he tells are real. I respect that, and he's just a really funny dude - great comedy instincts. To do stand-up on a stage for an hour and tell stories and make people laugh is incredible. I have crazy friends, so a lot of times when we're out, people recognize me on the street, but they will yell, 'This is Cameron Boyce!' and just run! They do that. Then I'm in the middle of the street with people looking at me.